Accueil / Stewart Enterprises Ltd.
At a young age, Larry Stewart began working around the shop of his family owned business. 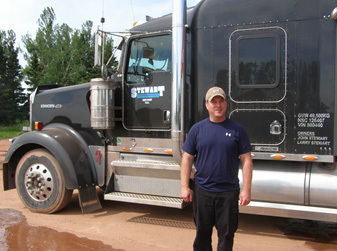 Located in West Point, PEI, Stewart Enterprises Ltd was established in 1974 by John Stewart, Larry’s father. The company began as a logging business and was one of the largest on PEI upon inception. They shipped to Cape Breton by rail to the pulp mill; however, when the pulp mills began to unionize and workers went on strike, John noticed that his business began to slow down and as a result he moved on to other business ventures. In the early 1980s, Stewart Enterprises Ltd purchased a shore property at the wharf in West Point and began sand mining. Between 1980 and 2008 they supplied sand to most of the concrete plants on PEI. From 1985-2000, Stewart Enterprises Ltd was also in the business of buying and selling potato trucks along with some used equipment. Today, Stewart Enterprises Ltd maintains their dealer’s license and continues to attend auctions and partake in some buying and selling. Presently, Stewart Enterprises Ltd, under the ownership of Larry Stewart, engages primarily in earth work, such as shale, gravel, sand, as well as hydro seeding for highway construction projects. They are also involved in scrap metal work whereby they purchase heavier steel, non-ferrous metals as well as cars by the ton, process or crush them, and ship the metal to Saint John, NB or Halifax, NS. Stewart Enterprises Ltd currently employs 5 staff and hires up to 3 temporarily for larger projects. This is certainly a remarkable story of succession. It is apparent that Larry inherited the same innovative and entrepreneurial skills as his father, as he is always thinking of new ideas and diverse initiatives. There is no denying that this business has evolved over time and continues to change as demand and economic conditions change. Throughout the changes in their business, CBDC has provided financing during various phases of the business. Larry states that “CBDCs are easy to work with and are flexible. They have a big heart when it comes to small business”.